Lilian and Todd Hrabchak are seen here in a Florida hospital on March 20. They are trying to get back home to Toronto but were told by their insurance company that there are no beds available. 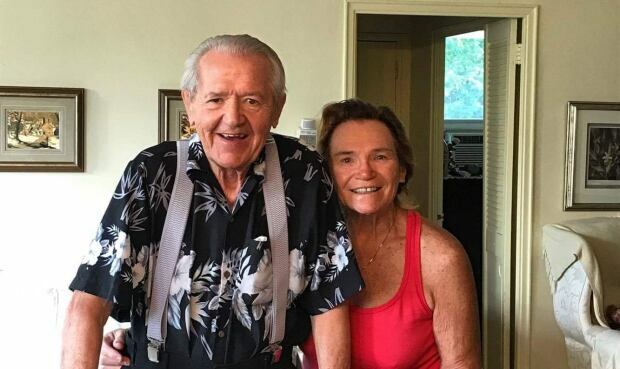 An elderly Toronto man is stuck in a Florida hospital, according to his wife, because their insurance company says that there are no beds available back home — a claim refuted by the provincial health minister. 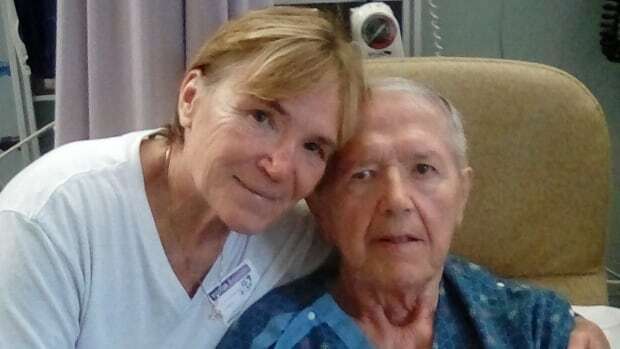 “He’s rotting in this hospital,” said Lilian Hrabchak of her 83-year-old husband, Todd Hrabchak. “I keep getting the same message from them — when we have a bed, when we have a bed,” she told CBC Toronto. Last Monday, Todd was admitted to the Englewood Community Hospital, close to the couple’s winter home in Rotonda West on Florida’s west coast. He had an infected cut on his shin that made it impossible for him to stand or walk. He arrived with a high fever and was “shaking, shivering and losing his mind,” Lillian said. He was given antibiotics and soon recovered, but is still weak. Doctors say he may need a pacemaker due to some complications, she said. Todd remains in a “seriously vulnerable state,” Lillian said. She has been in daily contact with her insurance provider, Allianz Global Assistance — a third-party administrator for Sun Life — in a desperate attempt to get him home and, preferably, into a Toronto hospital bed. But Allianz says it can’t. Several weeks ago, CBC London reported about two local men who were stuck in hospitals outside of Canada under similar circumstances. Asked about the situation in the provincial legislature, Health Minister Helena Jaczek said last month it was the insurer’s job to find a space for their clients in the province. “We know that there are beds available for critical care patients in Ontario,” she said in a statement to CBC Toronto. Jaczek added she has written to the Canadian Life and Health Insurance Association asking for a meeting to discuss the recent delays. Todd lives with dementia and suffered a stroke during heart surgery in 2013. Lillian, who is in her 60s, has been his sole caretaker for the last five years. She wants him back in Toronto so he can be seen by his own doctors, and get physiotherapy. “Physically he’s going downhill because he’s not getting any movement,” she said.